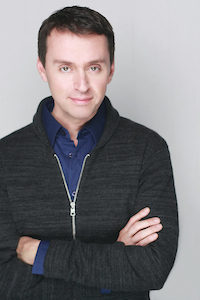 Broadway Blog editor Matthew Wexler chats with Andrew Lippa as he prepares for “I Am Harvey Milk,”—a one-night-only concert event on October 6 at Avery Fisher Hall. Proceeds will benefit the Harvey Milk Arts Fund at the Hetrick-Martin Institute. 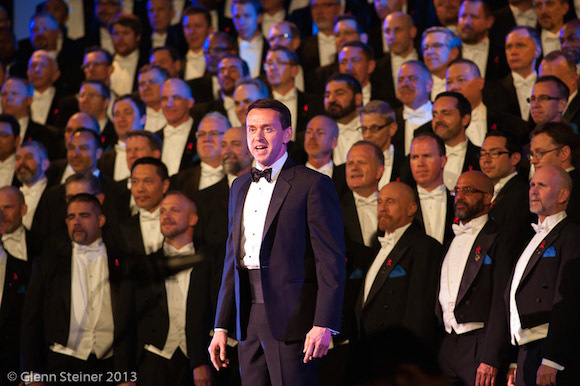 It was in October 2011 when Andrew Lippa received an email from Timothy Seelig, the San Francisco Gay Men Chorus’ (SFGMC) artistic director and conductor. Seelig was commissioning composers for a 35th anniversary commemoration of Harvey Milk’s assassination. Milk was the first openly gay man to hold public office in California and had been the subject of a 2008 Academy Award-winning film of the same name. But Lippa wasn’t interested in writing a five-minute installment. 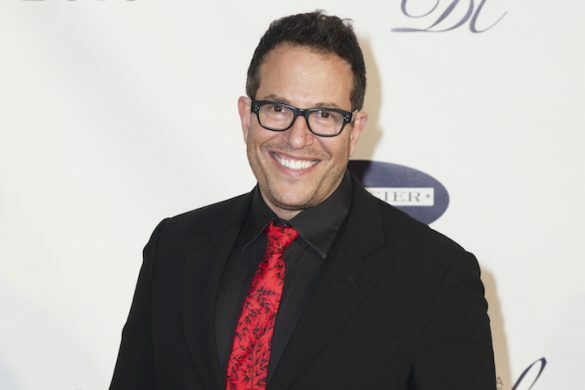 Raised in a Jewish household with roots in the theater, a late interest in LGBT rights and an indelible connection to New York City, the Tony- and Grammy-nominated composer/lyricist felt that there was a bigger story to tell. Instead of responding by email, Lippa picked up the phone (unheard of, these days) and called Seelig, saying that he was interested in writing the whole thing himself. 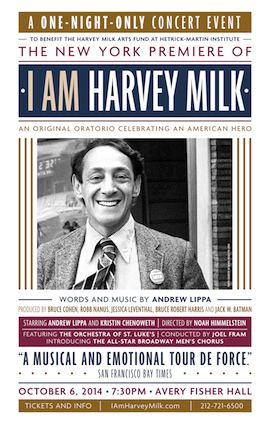 This eventually transformed into a 60-minute oratorio, “I Am Harvey Milk,” that SFGMC premiered in June 2013. The notion that Lippa would play Milk came to fruition during an early workshop of the piece. 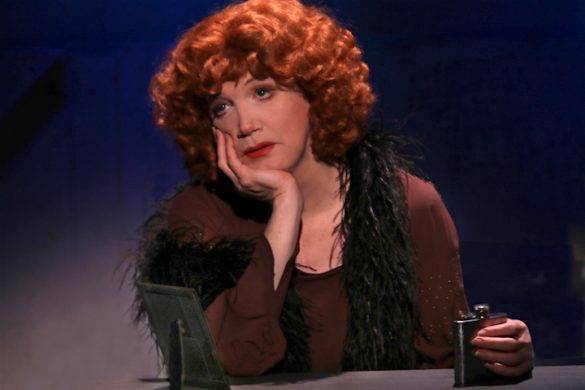 Seelig heard Lippa sing the role and thought it would be the perfect fit. Lippa couldn’t disagree. The similarity in the men’s lives infused Lippa with a deep emotional connection to the work—one that transcended the page. “If anything I am the dream deferred,” says Lippa. 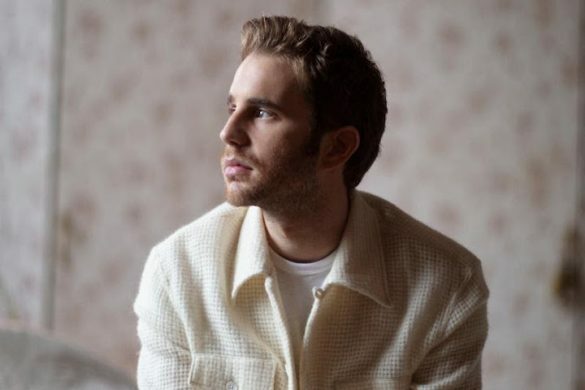 “It’s a 30-year-old dream that I’ve wanted to be a Broadway performer. But life happened differently. I have long wanted to return to being an actor and singer.” But one can’t deny his masterful interpretation of Milk’s life into musical form. Lippa never imagined the piece as a form of traditional musical theater given that it had been commissioned for a chorus 300 voices strong. He set about creating a 12-movement work based on the 11 months that Milk was in office plus the addition of a prologue. The idea of an oratorio (which Lippa defines as “ a large choral work based on a sacred subject”) seemed like the perfect fit, but he avoided a conventional linear narrative. “This is a fantasia. It’s not in chronological order, but the emotional story takes you by the hand,” explains Lippa. The composition incorporates counterpoint and multiple meters throughout, weaving a complex yet melodic interpretation of Harvey Milk’s life. One movement, titled “I Am the Bullet,” even explores the iconic politician’s life through the vantage point of the bullet that killed him. Take the leap for more on I Am Harvey Milk‘s conception and a video preview. Featuring a male chorus hundreds of voices strong, Lippa knew that he also wanted to incorporate a soprano soloist, a spiritual sound that could rise above everything else. “First, I thought about the women in his life, but it would have been too specific and there were too many questions,” says Lippa. So the role “became a composite of those people” and the most hopeful voice in the oratorio. 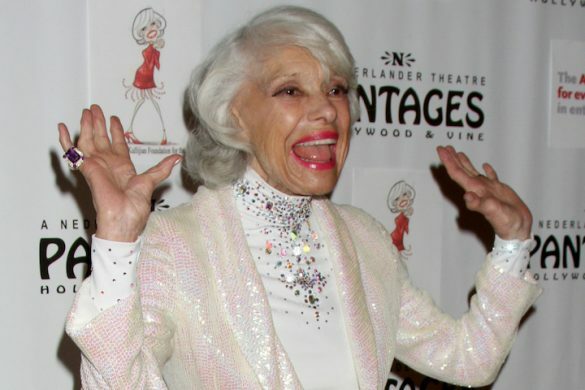 “When I sat down to write, it was Kristin Chenoweth’s voice that I heard in my head—actually, not just her voice, but also the themes of acceptance and the embodiment of faith and hope that is so a part of who she is,” says Lippa, who is also quick to point out Laura Benanti’s remarkable performance in the San Francisco production, which can be heard on the live cast recording.